Fashion designer Kate Bowen honored her summers at Saratoga Race Course with her clothing line. Bowen and her three children dig their feet into the warm beach sand, laughing and looking radiant in their Petit Peony beach ensemble. When Ivanka Trump dressed her children in the Petit Peony collection for the presidential inauguration, designer Kate Bowen gained international recognition. Now, she is looking to extend her brand with the new Katie Q collection for women. The collection is partially inspired by Saratoga and features dresses called The Travers and The Paddock. 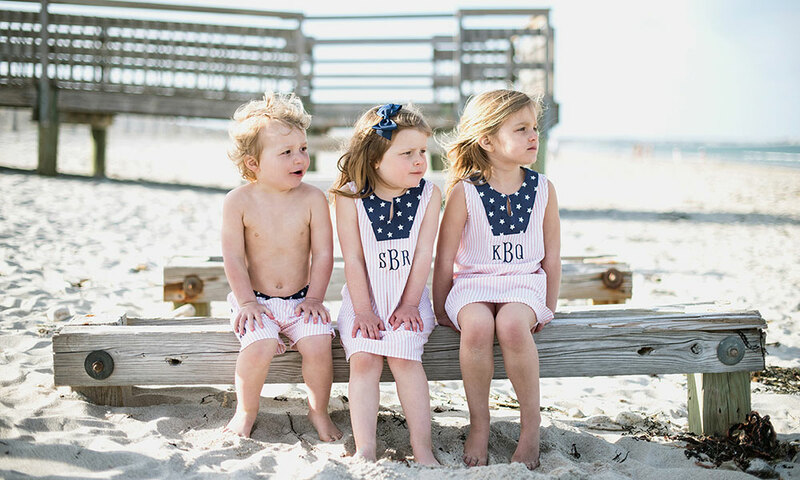 Katie Bowen’s three children Jack, Scarlet, and Kendal enjoy a day on the beach in their matching, monogrammed Petit Peony pieces, made especially for them by their mother. When Kate Bowen was growing up, her father always made a visit to the Saratoga Race Course a special day. That meant a reserved table in the clubhouse and fancy attire. He would look at the menu and say, “Anything for you, Katie Q,” she remembers. Nostalgia for her childhood is often the starting point for designing the her Petit Peony clothing line. And her new fashionable line of clothing – Katie Q – celebrates that just as Saratoga’s summer season is upon us. A mere three years ago, during a Vermont summer, Bowen taught herself to sew, choosing fabrics for her little girls she felt were a reflection of the innocence and magic of childhood. She had left the corporate world to spend time with her kids, and was expecting her third baby. By the time Bowen came home from the hospital with her newborn, she had seven orders on Etsy waiting to be filled. Petit Peony had made its debut, and two-and-a-half years later the adorable clothing was being sold in over 100 boutiques across the country, even making its way into Japan. In a single year, its online sales more than tripled, due to a strong social media presence, glowing press, effective boutique partnerships and a great deal of elbow grease. Bowen was completely taken aback when Petit Peony attracted the eye of influential women like Ivanka Trump and Marissa Mayer, the CEO of Yahoo, whom she considers an inspiration. Ivanka Trump choose Petit Peony to be featured on her Women Who Work campaign; she then asked Bowen to design the clothing for her children to wear to the presidential Inauguration. Bowen’s husband was driving the family home from a ski vacation when Bowen received the surreal request. She screamed when she read the email, nearly causing her husband to drive off the road. Katie Q is a collaboration with her good friend and designer, Louisa Smith, of Grapevine Interiors. They share a love for textiles, travel and design – all elements incorporated into Katie Q, which will share coordinating pieces with Petit Peony. Bowen sold out of women’s tunic dresses in one day, having created a line for women that is unique, comfortable and flattering. Bowen’s also incorporating a made-to-order component for an accessible price point as she believes women have a hard time finding something they love that fits perfectly. Katie lives with her husband, Ryan, and their three children, Kendal, Scarlett and Jack, in Duxbury, Massachusetts, where they also opened their first brick-and-mortar boutique and office. Petit Peony has been featured in British Vogue, Glamour, Town & Country, as well as Women’s Wear Daily and Yahoo Style.